Blue Moon Valley actually is an extremely blue river meandering through a lush valley of Jade Dragon Snow Mountain. Seen from a distance, it resembles a blue crescent moon inlaid at the foot of the mountain. That's how the place got its beautiful name! However, blue is not the only colour of the river. If it rains, the white mud and limestone rubble at the riverbed will be swirled up, making the water as white as milk. Therefore, local Naxi people name it White Water River (Baishui River). 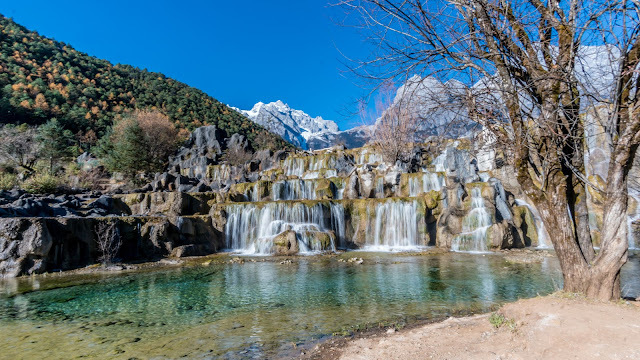 Blue Moon Valley is a popular spot inside the Jade Dragon Snow Mountain Scenic Area, 15 kilometers (9 miles) away from Lijiang Old Town. 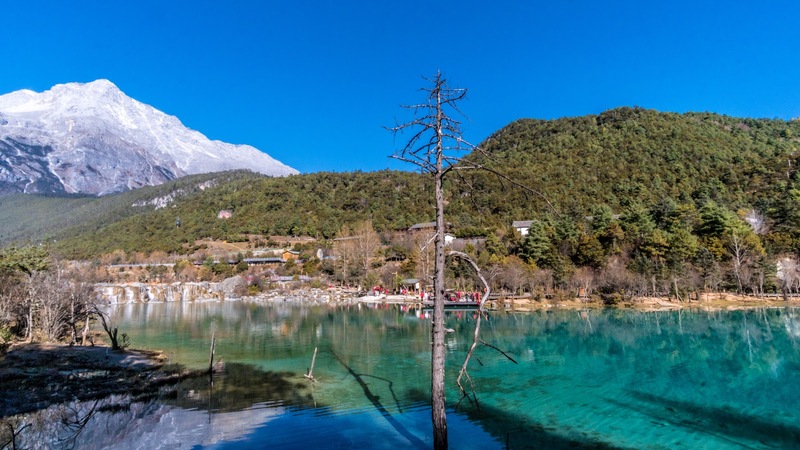 You can either take a through bus or charter a minibus to get to the Snow Mountain first. Take a through bus at Yuhe Parking Lot near the northern gate of Lijiang Old Down. You can buy the ticket in Tourist Service Center at the northern end of Lanhua Street, opposite Tianyu Hotel. The bus leaves for the Snow Mountain at 8.30pm and returns at 4.30pm; the bus fare costs CNY40 per person. Jade Dragon Snow Mountain is 22 kilometers (14 miles) away from Lijiang Old Town. You can charter a minibus at a charge of CNY200~300 for a round-trip; a one-way trip should take around 40 minutes. Upon arrival, take a sightseeing bus at the visitors' center near the gate of the scenic area to the valley; the fare is CNY20. Other spots inside like Spruce Plateau, Yak Plateau, and Glacier Park Cable Car Terminus can also be accessed by sightseeing bus. 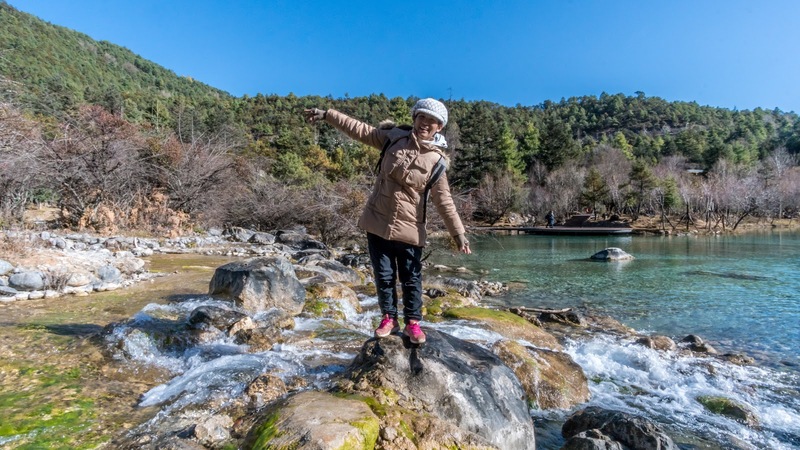 You can also signed up for any local tour agencies which you can find at Lijiang Old Town. You can compare for the best price especially when you have a larger group. Please watch out of "shopping tour". You can ask to clarify. Usually they will be honest with you or else just check their price after your few survey. If there is a tour that's cheaper almost 50% of your surveyed price, most likely it is a "shopping tour". 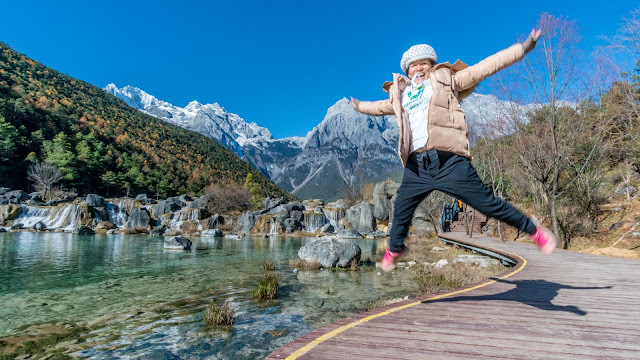 I signed up for a tour which cost me CNY400 per pax which includes trip to Blue Moon Valley, Jade Dragon Mountain, lunch, pickup from my hotel and transportation. We are given 1 hour to walk around the valley. 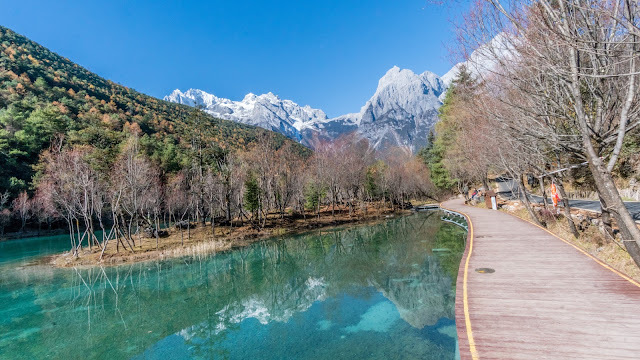 There is a man-made pathway for us to walk and optional you can hire a sightseeing car to travel between Blue Moon Valley and Spruce Plateau, Yak Plateau, and Glacier Park Cable Car Terminus. To be honest, 1 hour is not enough for me to enjoy this amazing breathtaking view of the valley. 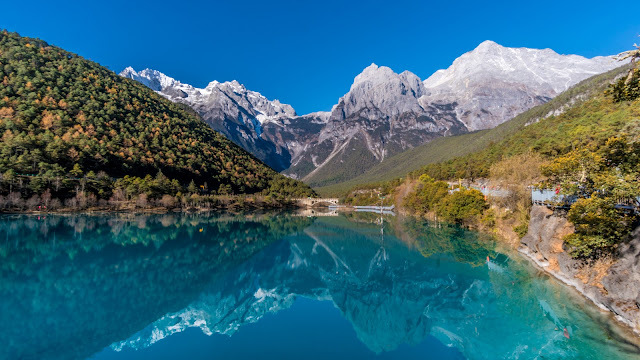 Snow mountain and blue lake is one of the perfect combination gifted by our mother earth. This amazing landscape can only be truly enjoyed if you witness it by yourself. Picture is just telling you 10% of the whole story. 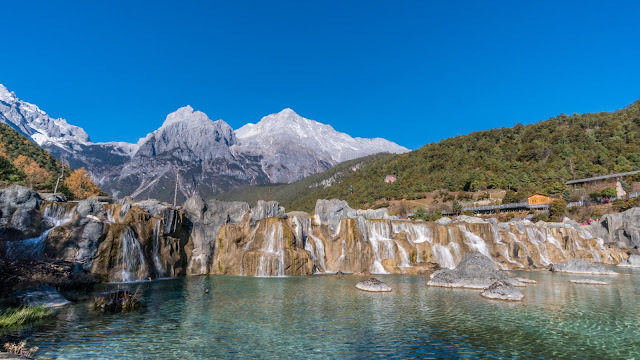 The White Water River is fed by melting snow and ice running down from Jade Dragon Snow Mountain. The water is freezing; even in summer, and people still cannot bear the piercing cold when they dabble in the river. But it is a favorite iced drink in summer. Legend has it that, when two Naxi youngsters fall in love, the boy will be tested by standing barefoot in the cold river in winter to show his committed love for the girl. Folks believe that this tested love will last forever in the presence of the holy snow mountain. So, the river is considered the Love River in local people's mind. 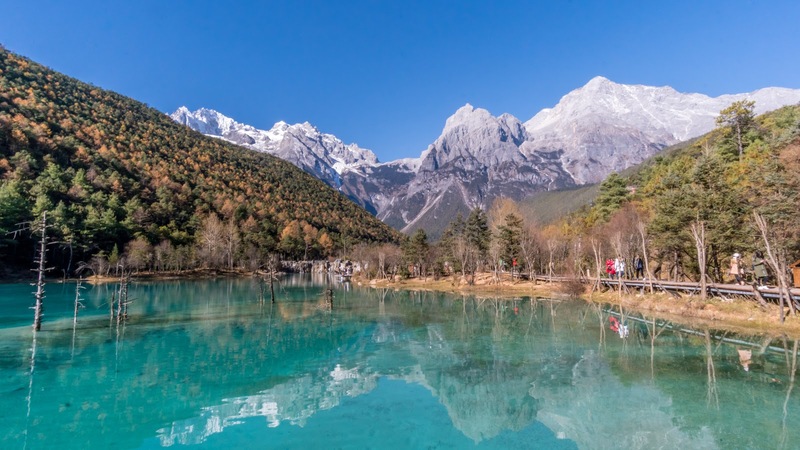 There are four lakes divided by small waterfalls or giant rocks along the river, namely Jade-Like Wine Lake, Mirror Pond, Blue Moon Lake, and Wave-Listening Lake. 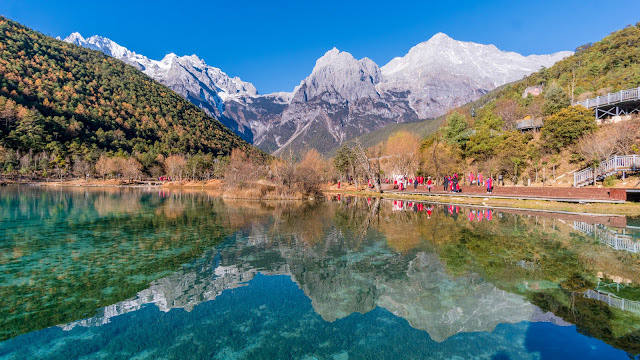 The lakes form a natural mirror reflecting the grand snow mountain, surrounding cliffs, and lush plants. There are small shoals dotted among the water, breaking the smooth surface of the lakes. You can take good pictures anywhere along the river. But the best point is the White Water Terrace on the upstream. It is made up of fan-shaped stairs with the river running down from each step, looking like shining shells under the sunlight. Shuttling between Spruce Plateau and the valley by ropeway, you can have a bird's-eye view of the deep and serene river valley, with the river as a jade girdle around the flourishing vegetation. 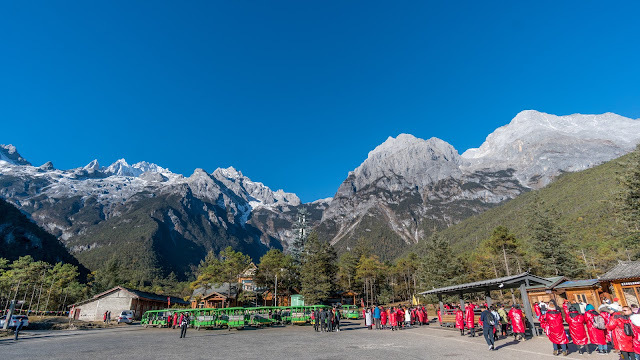 The whole Jade Dragon Snow Mountain area including Blue Moon Valley is closed up like a national park. You need to get a pass to enter. You can get a 2 days pass which is a combo ticket which allows you to visit Combo ticket the Jade Dragon snow mountain, Yushui Village (also called Jade Water Village), Dongba Valley, Yufeng Temple, Yuzhu Qingtian Scenic Resort, Dongba Kingdom, Dongba Gods' Garden and Baisha Mural) for CNY230. This one hour journey to the Blue Moon Valley is very worth it. You can choose to visit Blue Moon Valley only by paying the park entrance only but it is too expensive. So you have to include the Jade Dragon Snow Mountain trip no matter what. 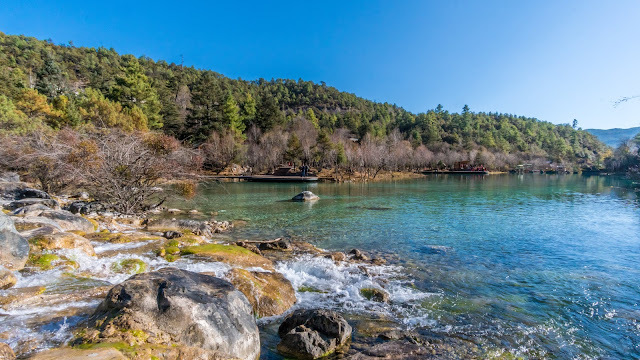 Since Jade Dragon Snow Mountain is the hottest tourist spot in Lijiang, so you wouldn't mind at all. As for me who have visited the snow mountain, I would rather stay longer at Blue Moon Valley. You will know why in my next post. 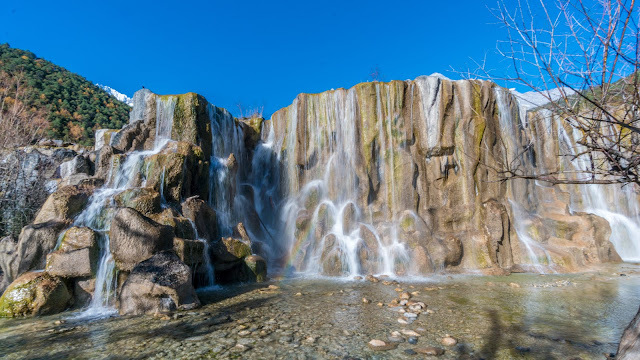 Total Price: CNY130 for the entrance to the park and you can visit Blue Moon Valley and Ganhaizi Grassland for free.